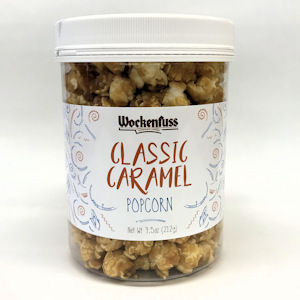 Home / Products / Candy / Caramel Specialties / Classic Caramel Popcorn, 7.5 oz. Popcorn drenched in our homemade caramel – rich, creamy, crunchy and sweet! Non-GMO Popcorn, Sugar, Corn Syrup, Butter (Pasteurized Cream, Salt) and Salt.ilk, Peanuts, Tree Nuts, Soybeans and/or Eggs.